The first born daughter, Carrie, has accepted the responsibility of mixing together the Hot Bacon Dressing for the Dandelion Salad for our Easter dinner. We shared our family traditions recently with Sue Gleiter, a food and entertainment reporter for The Patriot-News. A fun article, including the recipe for the Hot Bacon Dressing and a Dijon Sauce for the Asparagus appeared in today's 'your Life' section. Yesterday was the day.... butter, more butter, confectioner's sugar, peanut butter, coconut, dipping chocolate.... and lots of hours beating, shaping, chilling, rolling, dipping, packing, even taste testing. First up, Whipped Buttercream, a fluffy mixture of 1 lb. butter, 1 lb. margarine, 1 Tbsp. vanilla, and 2 lbs. confectioner's sugar all creamed together and then whipped on high speed for about 3 - 4 minutes. This mixture pipes easily onto a tray and then is allowed to chill until firm prior to dipping in the chocolate. Work quickly when dipping as they will soften pretty quickly and might require additional time in the fridge. Next up, Coconut Cream, a creamy concoction of 8 oz. cream cheese, 1/2 lb. margarine, 2-1/2 c. coconut, 2 Tbsp. coconut extract and 2 lbs. confectioner's sugar. Mix until well blended. Drop onto cookie trays with a large spoon. Chill for 15 - 30 minutes, and then roll into a smooth egg. Chill again prior to dipping. And finally, Susanna's favorite, peanut butter eggs. Simply a pound of margarine, a pound of peanut butter, and two pounds of confectioner's sugar. Blended and mixed until creamy and smooth. Sometimes it requires additional confectioner's sugar if the egg mixture feels too sticky. Simply blend it in by hand. Requires strong upper arms to thoroughly blend. Then, let the dipping and chilling begin! The peanut butter are the quickest to do since there is no chilling necessary once the eggs have been shaped. Once chocolate covered, chill again until firm, and package. We like to use baggies with color coded ribbons. Once you know the code, it's easy to find your favorite. All that remains is overcoming temptation so that we have chocolate covered Easter Eggs to share with family and friends. Do you make Easter Eggs? Do you have a favorite? Or, do you prefer something a bit healthier? We also make hard boiled eggs that have been dyed a beautiful russet color with onion skins. These are another family tradition for Easter, and will be made in the next day or two. tucked here and there, on steps, on books, they're everywhere! This assortment of spice tins represents only a very small portion of our mother's original collection. She loved old spice tins, and it gave us something to search for when we went to flea markets or yard sales. It was a guaranteed winner when given as a gift! Mom started collection spice tins when we could find them for 25 cents or 50 cents if they were really special. Now, you'll be lucky if you find them under $10.00! When it came time to pack up the old house full of collections, I requested a sampling of the old tins. The artist sister gathered the tins for me, looking at sizes, shapes, and colors of the tins so there would be a nice variety. In the end, I ended up with a collection of Cloves tins! They stand proudly in the kitchen, atop my spice chest, a reminder of days gone by. Two weekends of local garden shows was a welcome relief to the snowy winter we experienced. At the PA Garden Expo in Harrisburg my favorite exhibits were the ones presented by the local FFA's and Vo-tech Students. The future of Gardening is secure! This garden had a Southwestern Theme. Colorful and fun! Isn't this a most clever plant stand? This polished garden was prepared by the Juniata FFA. Photo Tag.... we've been tagged by PeggyR... the object of this game is to share the 10th picture in a series of photos. I had to go back several series until I found a grouping of more than ten pictures...(I have a heavy hand when it comes to deleting pictures!) anyway, that took us back to Hawaii-50. And that's what this picture is... it elicits fond memories of a beautiful family vacation on the Big Island, but we're simply Hawaii dreamin' now. If we play by the rules, at this point we're supposed to tag five other bloggers, but rather than specifically tag our blogger friends, I'm going to send out a 'blanket tag', and if you want to play, join in! Leave a comment on this post, and let us know you joined in the fun. I'll be sure to check out your photo! Post the 10th picture in a series, and share it with the blogging world. If you want to play the traditional game, tag 5 additional bloggers and be sure to share the instructions. Seeds are here! We love Renee's Garden Seeds. She has a large variety of herb seeds and also has heirloom veggies and flowers too. This year we are starting our seeds in eco-friendly pots that are quite inexpensive and easy to make at home. We have used empty egg shells in the past and they work well except that they are such a small pot. So this year we are making our own pots out of newspaper and also using toilet paper rolls. The rolls are very easy to make into pots. Simply make several one inch cuts on the bottom and fold ends in to form a base and create an instant tall pot. The newspaper pots take a bit more time to fold but it is a good rainy day project and they can store flat so they don't take up much space. Find complete instructions and a video on how to make the pots here. For a list of herbs that are easy to start by seed and other seed starting tips. Check out these posts from March 2008. We're happy to share a few extra tips on how to use your vanilla bean or homemade vanilla extract. Enjoy. ~It is the flavoring ingredient in "cream" soda. Add to hot or cold chocolate drinks, coffee flavored beverages, tea and fruit base punches. ~Add snipped pieces of vanilla bean to unflavored black tea. Store in an airtight tin so the flavors will for a few weeks. Your black tea will 'accept' the vanilla flavor easily. ~Add a vanilla bean to purchased vanilla for additional flavor. ~The bean is stronger than the extract it does not evaporate and can be washed and used over again. ~To make Vanilla Sugar: place 1/2 bean and 2 granulated sugar in your blender or food processor. Turn on high until well blended. Serve in tea, on cereal, sugar cookies, on fruit, etc. ~Simmer vanilla bean in warm milk and use in custards and puddings. ~In the tearoom, we sprinkle our oven fresh scones with confectioner's sugar that has a vanilla bean tucked in the jar. Do you use your vanilla bean and/or extract in any special way? Cordials and liqueurs are a favorite kitchen craft of mine so when the fresh vanilla beans and the time (a snow day) presented itself, I went to work making a homemade Kahlua. 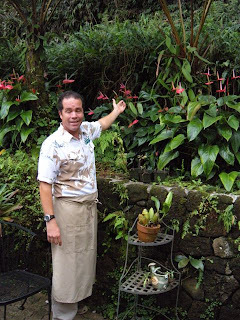 During our winter vacation to Hawaii we visited the Hawaiian Vanilla Factory and brought home some very fresh vanilla beans, so we set out to make our own vanilla extract. This is a very easy and quite rewarding kitchen craft. To make your own extract you will need a cutting board and sharp knife. Some drinking quality alcohol. We used a variety of alcohol, including a smooth Brandy, a 100 proof vodka and some rum (not combined though). The rum was inspired by thoughts (hopes, really) of Rum raisin cakes and rum truffles! You also want to use plump, supple, moist vanilla beans with a rich aroma. If you think you have a good quality fat bean use 1-1/2 beans to 1 C alcohol. Otherwise you might want to use 3 beans to 1 C alcohol. Simply slice the beans to expose the seeds (pictured here) and then bottle. Label and date your bottles too. While the color will change quickly, it will take about 8 weeks to be ready. Store in a cool, dark spot. As you begin to use your vanilla, turn it into a perpetual bottle of vanilla! As the bottle gets low, say down 1/3rd, add some more of the same alcohol to it. You can add more vanilla beans if you want. You can also add some simple syrup to sweeten it, (about 1 Tbsp. simple syrup per 2 cup vanilla extract). This will yield a smoother taste. Using a variety of vanilla beans (Madagascar, Mexican, Tahitian) will provide a more complex flavor. Use and Enjoy. Vanilla planifolia produces one of our most common flavorings. The Vanilla Bean is a pod from a species of climbing orchid. As an epiphyte it grows on decaying matter. The ripe pods are about 6 to 10 inches long and 1/4 inch thick. Preparing vanilla for market is a long process. The pods have no aroma when harvested! After being picked, they are stored in a drying shed until they begin to shrivel. They are then placed alternately in sweat boxes then warmed in the sun. It is during this process that the volatile oil Vanillin is formed and the aroma develops. When the pods are cured, they are graded for size and quality. It is also interesting to note that this plant can not fertilize itself! Prior to 1836, fertilization was left up to the birds, bees, and winds but then European botanists discovered they could transfer the pollen by hand. Now all cultivated species are pollinated by hand. It takes 3 years until the plant flowers, 24 hours to pollinate the flower (by hand) and 9 months until the beans are ready for harvesting. 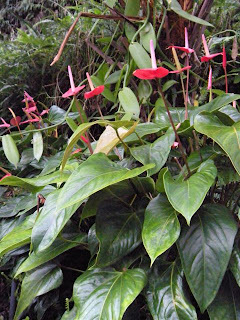 As many as two hundred racemes of flowers may be seen on a full bearing vanilla plant but commercial plantations pollinate only about 6-10 flowers. Wow! Vanilla is the second costliest spice, second to Saffron. We have a new appreciation of the price tag on Vanilla beans! Pansies love the cold weather so this break in the weather allowed us to get out and plant some cheery pansies in some of our pots. As the temps get warmer and warmer these little flowers will get smaller and we will over plant them with some different summer annuals. The Pansy is a beautiful variety of the violet. It differs from the violet in its diversity of colors and its fragrance is inferior to the violet. The French call it Pensee "a thought" from the phrase Pensez-a-moi or think of me. Our English pronunciation is a version of Pensee. "There are pansies," says Ophelia "that's for thoughts."~Shakespeare. Sometimes called Heart's Ease with the thought that those we love are not unmindful of us when we are absent. Pansies are also an edible flower and can be crystallized preserved to use to decorate a cake. This past Sunday was our Mad Hatter Tea Party. We were pleased to welcome 'Alice', portrayed by Alisa Dupuy, to our event. She shared delightful stories about Alice, the clothing of the era, poetry, and photography techniques. Always charming, always elegant! Special thanks to our local doll club, they brought their collection of Alice in Wonderland and White Rabbits to add to the festivities. 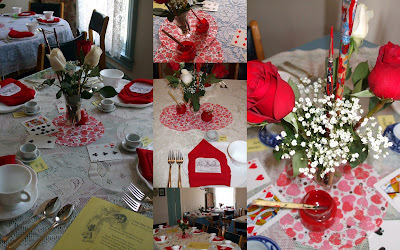 The Centerpieces for our Mad Hatter Tea Party were a combination of white and red roses... with a nod to the tree with white roses that the Queen's gardeners paint red with the hope of tricking her into believing that the tree is the red rose tree that she ordered. Small red paint pots were at the base of the arrangement, and several red tipped brushes were tucked in among the roses. Playing cards symbolize Seven and Five, the Queen's gardeners, busily painting the roses. "Well! I've often seen a cat without a grin,"
thought Alice; "but a grin without a cat! It's the most curious thing I ever saw in my life." This curious grin is hanging in the front parlor, between the two large windows. Smiling at me, inspiring me, as I put together the finishing touches for our very special Mad Hatter Tea Party. These festive Meringue Mushrooms will be a fun addition to our Alice's tea party. Thanks to ME for sharing a link to a basic meringue recipe, these mushrooms are ready to be served! According to Caterpillar, one type of mushroom will make you grow taller, and one type will make you grow shorter. Alice, taking this advice, tucks these mushrooms into her dress pockets, using them as necessary. My advice regarding mushrooms.... best to prepare them on a humidity free day! Pulverize the sugar so it is very fine, be sure to add it gradually to the beaten eggs, beating well in between each addition. And monitor the oven, making sure they don't brown prematurely. I used a gentle 200 degree oven for slightly over an hour, rotating the trays on several occasions. They turned out perfectly, this time. Sweet and crisp. Sometimes, working with meringue can be finicky. Just keep at it! as preparations are under way for The Mad Hatter Tea Party this Sunday. "Take some more tea," the March Hare said to Alice, very earnestly. "I've had nothing yet," Alice replied, in an offended tone, "so I can't take more." "You mean you can't take less," said the Hatter, "It's very easy to take more than nothing." "This is the most curious tea party I've ever been to", said Alice. Hopefully, photos and the menu will be shared in a few days! In the meantime, its back to stuffing the Dormouse into the teapot. It's an often repeated refrain. And it's always exciting when you know the answer! or are able to quickly find an answer. Knowing there was a thawed pork loin in the fridge, I had the starting point for dinner. Next step, Google! Pork Roast Crock Pot Recipes. Perfect! It led me to a recipe that, fortunately, had a list of ingredients I had on hand... onions, mango chutney, ginger, curry, garlic, brown sugar, and mustard. In addition, it came highly recommended with three 5-star ratings. It is in the crock pot now... can't wait to try the combination of sweet and spicy, and now I'm off to run errands while dinner quietly does its own thing. Addendum: Dinner was delicious! Enjoyed by ages 10 - 88! The pork just fell apart, shredded easily. The sauce was sweet and spicy, thickened with a bit of corn starch, and savored with the meal. Yum! This recipe gets 5-stars in my book just for its ease of preparation.